Four trains: one unique event! A ONE-off event on April 23 saw four generations of East Coast traction run side by side along the four-track main line north of York. It was staged as part of a publicity campaign for Virgin Trains. 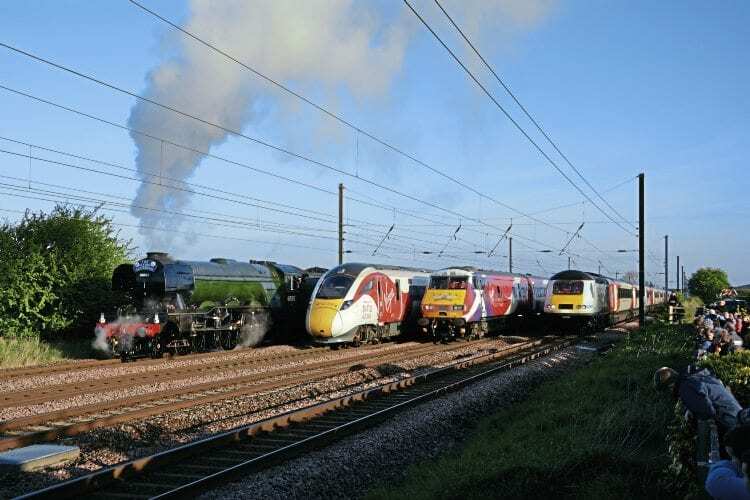 The event – jointly organised by Virgin Trains, Network Rail, the National Railway Museum, Hitachi and Welcome to Yorkshire – featured A3 steam loco No. 60103 Flying Scotsman, Hitachi IEP No. 800101, VTEC Mk.4 set Nos. 82205/91105 and VTEC HST Nos. 43238/43290. The NRM’s ‘Deltic’ No. 55002 was also involved ‘top and tailing’ with Flying Scotsman. The event took advantage of an engineering possession that had closed the East Coast Main Line north of York. It began at Tollerton, about 10 miles north of the city, where the trains assembled in the early hours before setting off in formation around 06.00 – pausing for a press line-up alongside The Sidings Hotel at Shipton.